The frames of Wee Mary (Fowler 17732 of 1928) at Lune River on 4 May 2003. The Tullah Tramway were presumably pleased with the operation of their 0-4-0WT locomotive "Wee Georgie Wood" (Fowler B/N 16203 of 1924) as a second locomotive "Wee Mary" (Fowler B/N 17732 of 1928) followed a few years later. Wee Georgie Wood and Wee Mary were combined to form a single operable locomotive during an overhaul after World War Two, with Wee Georgie Wood now preserved as the operating locomotive on the remaining portion of the Tullah Tramway, while the derelict frames and wheels of Wee Mary are stored at the Lune River sidings of the Ida Bay Railway in Tasmania's south. A brief history of the Tullah Tramway and its locomotives can be found on the Wee Georgie Wood Steam Railway website. 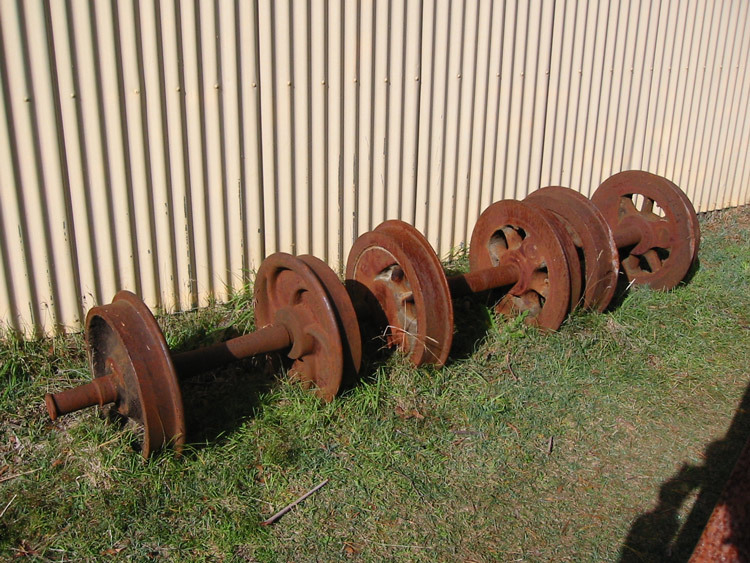 Amongst the bric-a-brac at Lune River could be found this set of locomotive wheels. 4 May 2003.